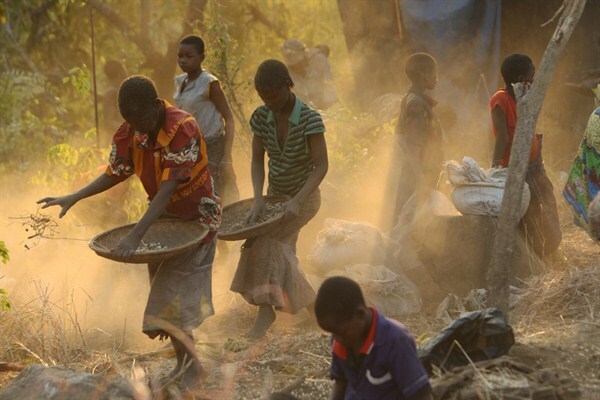 Women and children separate grain from soil, Machinga, Malawi, May 24, 2016 (AP photo by Tsvangirayi Mukwazhi). Driving along central Malawi’s M5 lakeshore highway in mid-2016, a visitor could be forgiven for mistaking the surrounding countryside for desert. In what should have been an area lush from rains ending in April, the land of gently sloping hills, baobab trees and fiery sunsets was parched. Although the road meandered past some signs of greenery—mango trees, tobacco fields, irrigated sugar cane for export—the dust that stretched to the horizon did little to mask that Malawi, like much of eastern and southern Africa, is in crisis. Hit by the strongest El Nino in a generation, which disrupted rainfall patterns, ruined crops and unleashed drought conditions from Addis Ababa to Cape Town, the region now faces one of its most acute food shortages in memory. According to the United Nations’ World Food Program (WFP), 18 million people in seven countries will need emergency food support by the end of the year, as stocks from April’s notably poor harvest dwindle.